Ask any Punjabi or North Indian about their favourite “maa ke haath ka khana” and at least 2 out of five will say Parathe! I have no statistical evidence for how I came up with that figure of course but there is some truth in my claim. North Indians love their parathas, sometimes stuffed and sometimes just plain with a side of sabzi, Aam ka achaar or dahi. Aloo Paratha is a universal favourite I can say with the same gut feeling that comes up with aforementioned random stats. But for me, my favourite stuffed parathas are Gobhi Parathas. Gobhi or Cauliflower is the current favourite ingredient for most western websites and food related pages like Buzzfeed’s Tasty amongst many others. They present it sometimes as a meat replacement or a low carb option to make pizza crusts, vegan cheese, breakfast hash and even bread. I think they are borderline obsessed with it. But Indians have been using Gobhi in their sabzis like mixed vegetables, Tadka Gobhi, Pakodas and of course Gobhi Parathas since forever. Every year around September, the sabzi bazaars in India see the arrival of the new Gobhi of the season. I know Gobhi is available all year around, but the actual new crop of Gobhi arrives on the carts around these months and the new Gobhi has florets that my mom describes as khili khili (blooming) with green delicate danthal (stalks) and is more flavourful in my opinion. So besides making delicious Aloo Gobhi, Danthal ki sabzi and Tadka Gobhi, we also make delicious and loaded Gobhi Parathas. These Gobhi Parathas would reappear on our plates and our menus on most Sunday mornings and stay till late winter. But my mother tells me that she prefers to make parathas with Gobhi that comes from October onwards. The new Gobhi of September is preferred just for sabzis. Late winters months of March or April sees Gobhi that we consider comparatively tasteless and less juicy. Gobhi from mid-winter months is juicier. And hence in April or maybe from Holi time, we move to other seasonal veggies from Spring time like Bhindi, Ghiya and Tori (gourds). 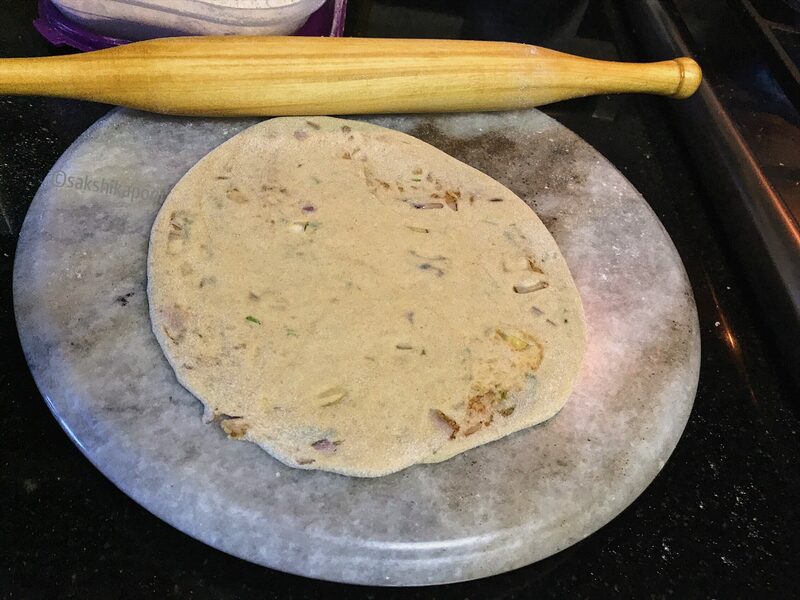 Now that we get Cold storage Gobhi all year round, we make parathas almost anytime. But we still keep a look out for new crop of Gobhi around September to make sabzi with. 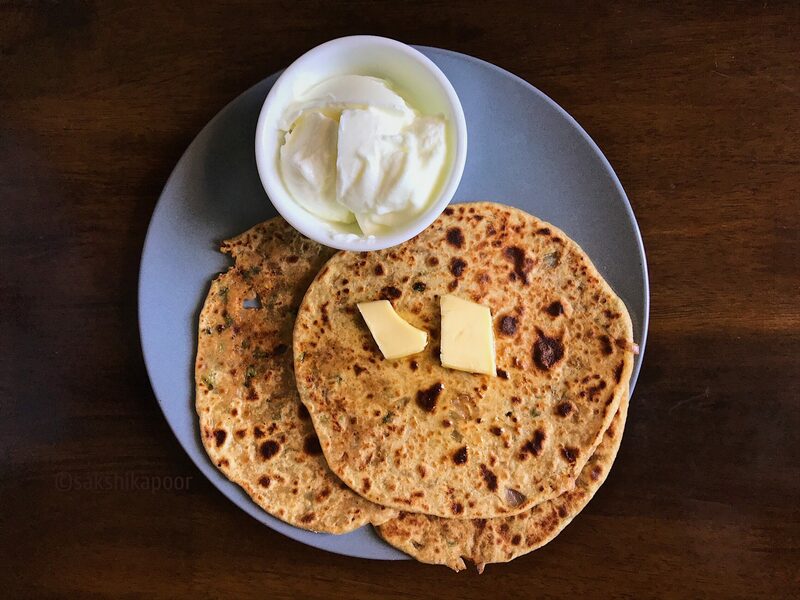 Parathas served with salted Amul butter is a standard feature in most Punjabi households. And trust me that is a combination made in heaven. But other companions like Plain homemade Dahi and some Punjabi Aam ka achaar take it a few notches up. As a kid, I would always pair my buttered Gobhi Parathas with some Dahi sweetened with sugar. The crispy hot parathas filled with chewy gobhi pyaaz filling would cool down quickly once I would dunk them in sweet dahi. Also because I was too impatient to let the parathas cool down to eat. The contrast of sweet and salty, hot and cool, spicy and creamy was an experience that was no less than gourmet for me at that age. And as I write this, I am craving Gobhi Parathas made by my mother. Start by preparing the dough. You can prepare the dough by hand in a big vessel like Paraat or a big wok. Or you can prepare it in a food processor like I do. 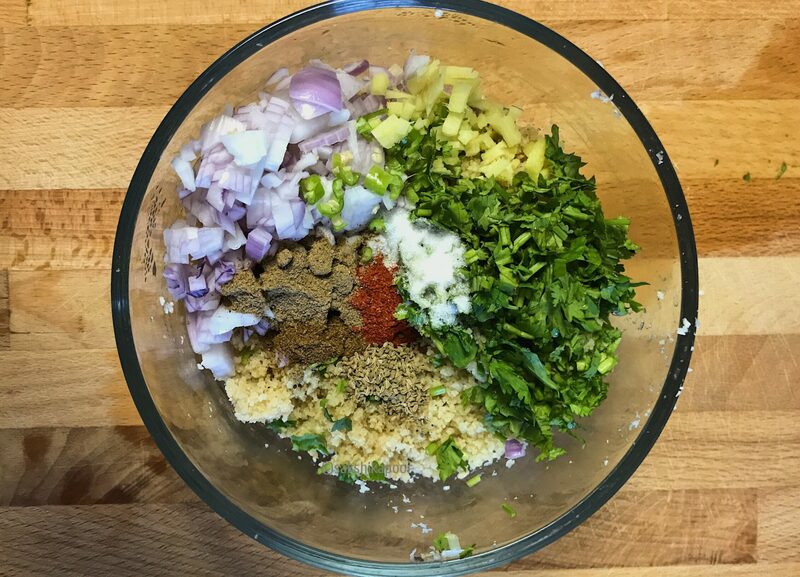 Measure the Aata and place in a wide bowl or a food processor. Next, add salt according to taste and mix. If you are making the dough by hand, gradually add a small amount of water and mix. You would need to add water gradually to see how much it soaks. Some varieties of whole wheat flour absorb more water than others, while others don’t. Knead the dough by adding more water and folding the dough gently. Do this till you find the dough is soft when poked with a finger and a ball can be teared out without using much force. If the dough is not soft enough, add a small amount of water and knead some more. Make sure the dough is not too sticky. If the dough is sticky, add a bit of dry flour and knead more to absorb the excess water. If you have a food processor, you can use it to make atta. 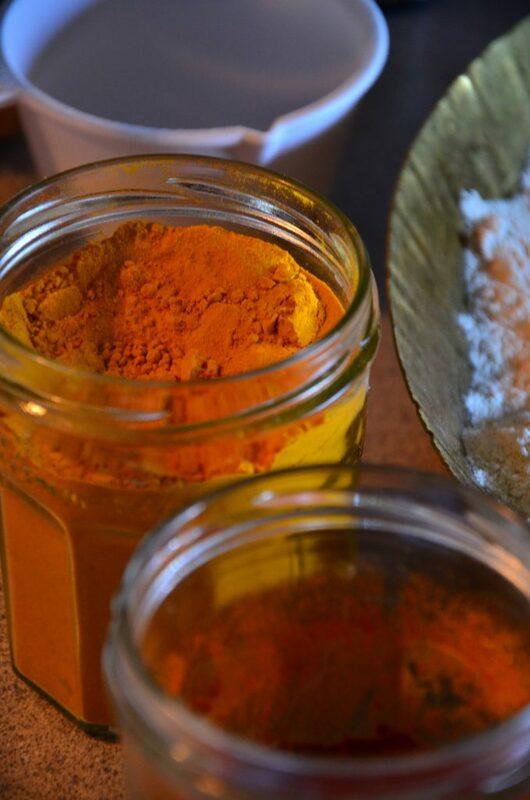 Add measured cups of aata and salt in the processor jar. Close the lid tight and start the food processor. Through the feeder tube, add a small amount of water in a steady stream while the processor is on. You will soon see that the flour looks like a crumble. You may need to shut the processor in between depending on the manual instructions. If it is a stronger one than you may keep it running. Add more water in a steady stream till you see the crumbling dough come together in rough balls. Keep the processor on and you will see a big dough ball come together in another minute or two. Process till you see no flour is sticking on the sides of the jar. Adjust consistency with dry flour or water. Once you are satisfied with the softness and consistency of the dough, sprinkle a few drops of cooking oil and slater the entire ball of dough. Transfer the resultant dough to a vessel or box that can be covered and place in the fridge for at least 30 minutes. Wash and drain the Gobhi and cut at the stems to take out the florets. Before you move on to the next step, make sure the Gobhi is dry. To grate the Gobhi, you can either use a box grater or a food processor. I used the Fine Grate disk attachment in my Kenwood Multipro Compact Food Processor. Wash and drain the other vegetables and herbs. Peel and chop the onion, green chilli, ginger and garlic. Bunch and chop the herbs. Mix all the chopped vegetables and herbs with the gobhi in a bowl. Add all the spices and salt mentioned above and stir to incorporate. Note: If you are making the filling ahead of time, do not add the salt. Adding the salt make the onion release it’s juices and the filling mix becomes watery. It is really difficult to make Gobhi parathas with a watery filling. So add the salt only at the last moment if you are making the Gobhi Paratha filling ahead of time. Place a tawa/ griddle or flat pan on medium high heat. Take out the dough from the fridge and tear a small ball of dough. Coat it with some dry aata (Palethan) and roll it out into a thick rough circle that can fit the palm of your hand. You may do this on a clean kitchen-top or on a chakla. 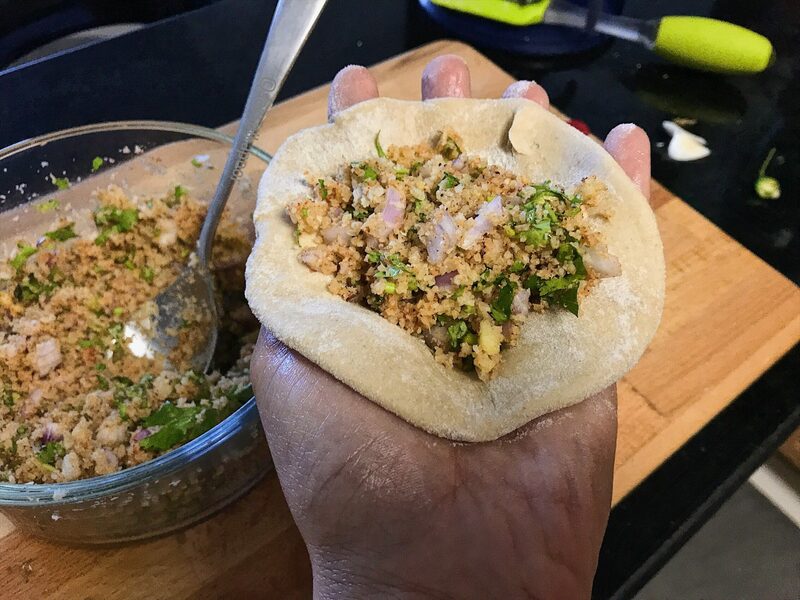 Place the circle on your palm and put a spoon or two of the Gobhi Paratha filling in it. Do not overstuff it as that will result in the paratha disintegrating. Now bunch up the corners towards the centre to cover the filling and make a ball. Dust this stuffed dough ball in some more dry aata and roll it out on a flat surface to evenly spread out the filling. The resultant paratha shouldn’t be too thick or too thin. Place the rolled out stuffed paratha on the hot tawa and cook each side with some ghee or vegetable oil. Repeat with the rest of the dough and filling. 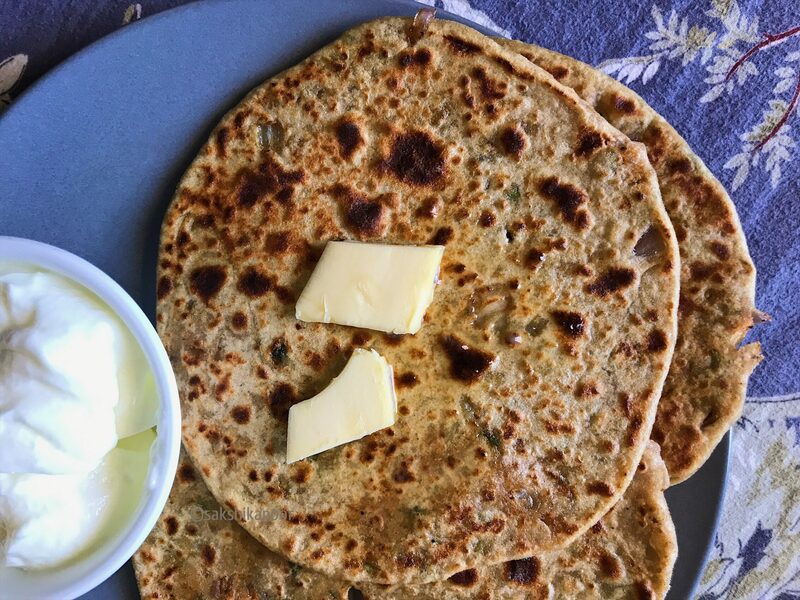 Serve Gobhi Parathas hot with some Butter, pickle and Homemade Dahi. 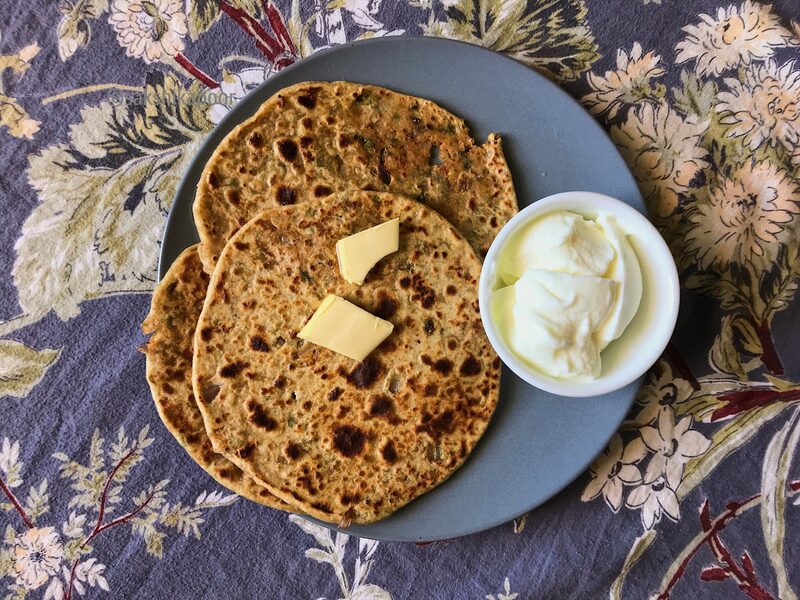 Cauliflower stuffed Indian flatbreads or Gobhi Parathas are the perfect brunch meal when served with some Homemade Yogurt, Mango Pickle and Butter. Measure the Aata and place in a wide bowl or a food processor. Next, add salt according to taste and mix. If you are making the dough by hand, gradually add a small amount of water and mix. You would need to add water gradually to see how much it soaks. 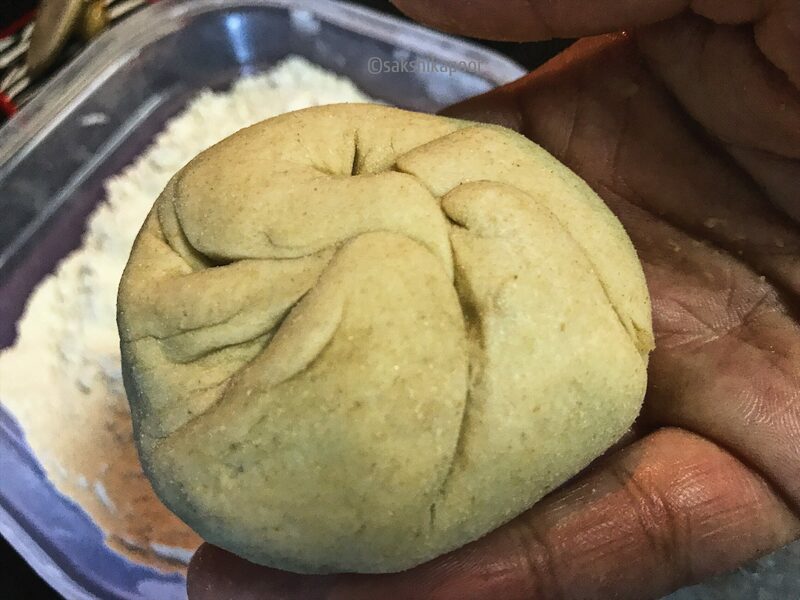 Dust this stuffed dough ball in some more dry aata and roll it out on a flat surface to evenly spread out the filling. The resultant paratha shouldn't be too thick or too thin. Note: If you are making the filling ahead of time, do not add the salt. Adding the salt make the onion release it's juices and the filling mix becomes watery. It is really difficult to make Gobhi parathas with a watery filling. So add the salt only at the last moment if you are making the Gobhi Paratha filling ahead of time.